Yoohoo, I will be starting my 4th aligners today and I am hoping to watch my ‘invisalign video’ finally! I want to peep at the end of the tunnel! Completely useless and silly communication process! I stepped out, to where the reception was, where Dr. E was still on the phone, so that I can speak to her directly. I asked her about my attachments, as I don’t have them yet and I only have 5 more aligners to go for my upper jaw, and that’s only another 2 ½ months! She replied, “Oh, you lost your attachments?” It seems like she was ready to send me off if I didn’t mentioned them. I was shocked!! Does this mean that she didn’t know that I didn’t have any attachments in the first place? Is this a joke! I told her that I didn’t have any attachments yet and I told her that I reminded her one month ago. She sent me back to the dentist chair. She attempted to put the attachments for me. ‘Attempted’ because she seemed to have a lot of trouble doing it. After several tries, she finally put two attachments on my upper jaw after 25 mins! And I forgot to mention that the procedures that she did seemed to be different from what I read online and from the directions sheets in my aligner box. She put the attachments first by estimating where they would be before I wore back my aligners. I guessed at this moment, I just hope that she knew better. I asked her why was the attachment done now and not earlier. She said, “Oh yours is a different case, I was on the phone with Invisalign earlier. I didn’t want to aggravate your teeth as they were injured.” I really hoped that she is not lying. I don’t want to know that my invisalign process failed because the attachments were put on too late. The attachments or buttons look like ‘rice grains’ that are stuck to your teeth. Mine was a few tones lighter than my teeth, so you can definitely see them. It actually do feel like you have some rice grains stuck on your teeth but I got used to in just a few days. Luckily, I only have 2 attachments in total. I asked Dr. E about the ‘video’ which she promised to show. She said, “Oh, you were supposed to watch it earlier, now that it’s over, you don’t have to watch it. It’s ok.” I’m getting frustrated. She went on to say that she has problems with the invisalign company and ‘my first set of aligners’ they sent was rejected by her as she didn’t like how they looked. Wait a minute, she told me a few months ago in July that the mould was not properly taken and the computer at invisalign rejected my mould. She was either lying that time or now. I’m now in Dr. E office for more than an hour and running late for my next appointment. I didn’t want to create a fuss at this time. Before I left, I asked her for another invisalign container as I read in the box that I was supposed to have two of them. She said, ‘Oh, you don’t want to do that, you will be mixed up’. I insisted and I was given a generic box. I need to sit down with her on my next visit and let her know my concerns. And yes, before I walked out, I reminded her that they have not given my 5th aligners yet. I do not like the process. Tips #9: Asked the dentist to go through all the items with you in your ‘Invisalign box’. Make sure you ask all your questions on instructions, attachments, and/or the entire process before you order them. Invisalign: Don’t Make This Expensive Mistake! I’m getting the hang of wearing the aligners. I just need to remind myself to take the box so I have something to store my aligners when I leave the apartment! I would just wrap the aligners up in some tissue if I forgot my box. The other day when I was at my friend’s house, I actually threw away my aligners with the rest of the tissues on the dinning table. Luckily I remembered afterwards and managed to find my aligners in the garbage container! Close one! Tips #8: Put your aligners back to the ‘invisalign box’ when you take them out, be very vigilant if you wrap them up with tissues! Invisalign: Do You Know You Could Easily Damage Your Aligners? The 3rd set of aligners is the MOST painful of all so far! I’m suspecting maybe I need the ‘buttons’ earlier…. It felt like someone just used a baseball bat to knock on my entire row of front teeth! I’m just going to bear with it. I insist that I’m not taking any painkillers! It hurts the most when I took the aligners out for meals. I almost felt like just skipping the meals. The pain was much more tolerable just after half a day! Maybe I’m used to it, or the teeth actually moved or the ‘aligner’ actually ‘stretched out’. Either way, I’m glad! I have been more mindful of not rinsing them with warm water, which I use to brush my teeth. 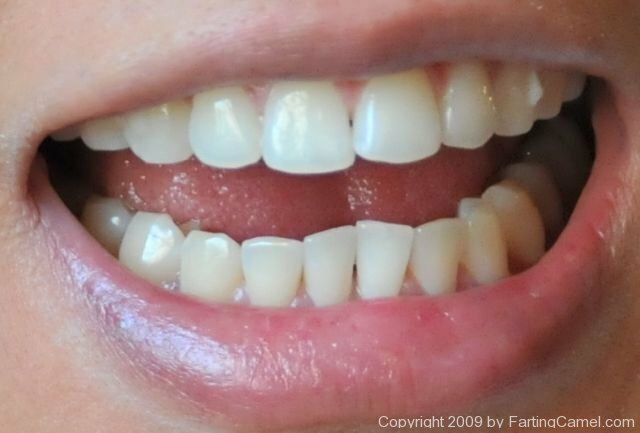 I read on the Internet that it might ‘change’ the shape of the aligner! I just thought, I should have been told, by the dentist in the beginning, of what to do and what not to do. The only ‘advice’ that she gave, believe it or not, was that, ‘the bigger aligner is for your upper jaw, the small one is for your lower jaw… see the teeth size….’ She is a sweet lady but I just thought that maybe more advice could help, or at least pass me some written literature on the box. Tips #7: No hot or warm water when you are rinsing or brushing your aligners. And only drink water that is cold or at room temperature. 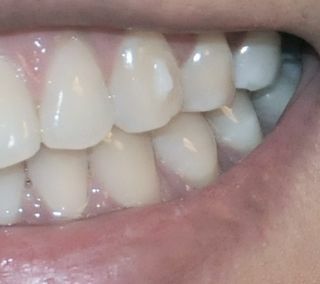 Invisalign: Changing my Aligners (Pictures)! Dr. E came in and passed me my 2nd and 3rd sets of aligners. She popped the 2nd set of aligners into my month and it hurts! It is like ‘wearing a horse shoe’ on your teeth, constantly pressing tightly onto your teeth! I guess this thing works then! However, I wasn’t shown the ‘video’ that I was promised, and once again the whole visit only takes 3 minutes, which I was charged $300. Dr. E said she didn’t set up the computer, so she promised it on the next visit, which is one month later. I asked about the empty ‘bubble’ on my aligners for the ‘attachment buttons’. She said that she would put them on later. I hope she knows what she is doing! 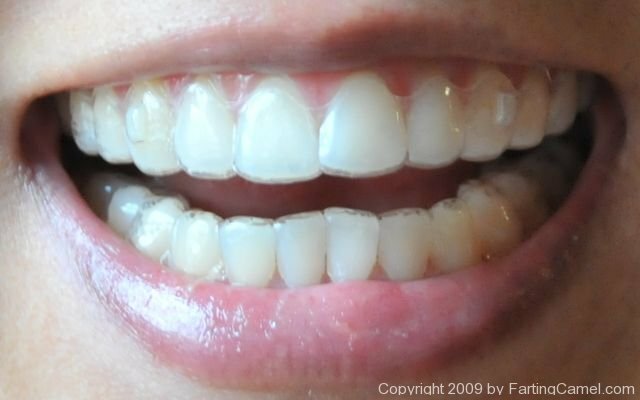 Pictures taken after 2 weeks (after the 1st aligner). I noticed that my front teeth seems to have shifted and the ‘gaps’ between teeth gotten bigger! I noticed that one of my front teeth is now less crooked. Am I having illusions? After all, I have only worn the aligners just for a week! I find cleaning the aligners time consuming. 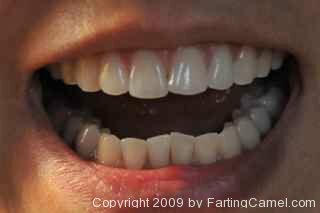 I knew that there are cleaning crystals which you can get direct from Invisalign and some people on the Net also recommended using similar cleaning solutions for dentures. I checked with Dr. E and she advised to just use the normal toothbrushes and tooth paste. It was easy to clean them on the first few days, but as I wore them longer, there seemed to be a ‘film’ forming on the aligners. And it just takes a while to completely clean them, especially there are ‘groves’ inside the aligners. It’s like brushing 2 sets of teeth every time! I read about a lady having her first cavity after she started Invisalign. She thinks that it is because the tooth was completely covered and there was no saliva to ‘rinse’ it. I’m not going to let that happen! I’m brushing!! Update 1: I was advised that it is best to use ‘normal’ toothpaste as some ‘whitening’ tooth paste have little grains in them that might ‘scratch’ the plastic surface of the aligners, creating wonderland for germs. Invisalign: One Thing You Could Easily Forget to Do with Invisalign! It is really troublesome to take the aligners out when you need to eat, I begin to take them out for longer period at one time… for meals, then for desert, then for tea. So this morning after breakfast, as I was rushing, I went out of the house without wearing my aligners. I will only be back 5 hours later. I really thought that I would be good in wearing my aligners! So today, I only ended up wearing my aligners for 17 hours instead of the usual 22 hours. Tips #5: Put something at the door or on the dinning table to remind you to wear your aligners after meals! Invisalign: You Could Be Missing Your Attachments Without Knowing It! The first picture which I saw online of a person wearing invisalign aligners have 2 ‘bubbles’ on the upper aligner just like me. I thought that the aligners are supposed to be ‘made with them’, just like the bubble at the bottom of the glasses. However, I kept reading about ‘buttons’ and ‘attachments’ online and realized that these bubbles are supposed to make spaces for attachments to be fixed on my teeth! Did Dr. E forget to fill them in? I was only with her for like a minute when I collected my aligners. Since my appointment with Dr. E is in a week’s time, I decide to ask her face-to-face. It’s day 4th of my invisalign journey. Not too bad, I’m getting the hang of it. I don’t feel any more pain. The aligners go on and off with ease. I begin to worry for the lack of pain. Is it working? Is it not working? The aligner seems flimsy to me. Does it really work? Tips #4: Don’t think and over analyze too much. Have faith in the process! Update: See my first review after one week! And another review after three weeks (Pictures). 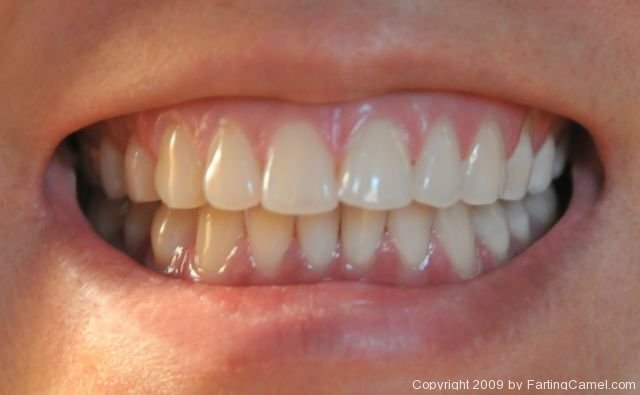 Invisalign: Avoid This Simple Mistake and Keep Your Teeth White! My two front teeth were very sore on the 2nd day. (My front teeth jut out at an angle, which my husband jokes that it is the perfect slide for the ‘bacteria’ in my mouth!). One of them REALLY hurts when I ‘pulled out’ the aligners. Whenever I take out my aligners for meals, I tried to ‘fill myself up’ as much as possible! Might as well! I know that some people eat less and snack less during their invisalign treatment. I don’t usually snack much but I find myself trying to eat more at one go whenever I don’t have my aligners. So maybe, it’s a ‘weight gain’ plan for me! Earlier, I almost drank my tea with my aligners! Luckily I remembered and took them out. I read that I can only drink water (at room temperature or colder) when I am wearing the aligners. Tips #2: Drink ONLY water when you are wearing your aligners. Having soda, tea, or coffee? Please take them out before drinking. They will stain your teeth and might even promote cavity. It’s very light, very clear. I was excited to see my invisalign aligners lying in the dentist office. I was supposed to pick them up two weeks ago but I was travelling and can only pick them up today. I hope that my teeth haven’t moved much to render the new aligners useless!! I grind my teeth at night and was given a mouth guard to wear before I sleep. Somehow, I’m quite diligent to wear it at home but am hopeless when I’m travelling. I had probably worn the night guard three times in the entire month! Tips #1: After you make the mould for invisalign, pick the aligners as soon as you can. And if you were wearing night guard, WEAR THEM diligently! Bearable…. it’s bearable… I consoled myself. That is it; I only stayed like a minute with the dentist. I was set off to come back in two weeks, which she told me she would spend twenty minutes with me. Oh well, I’m so eager to share my invislign experience that I forgot to tell you why I’m wearing them in the first place. 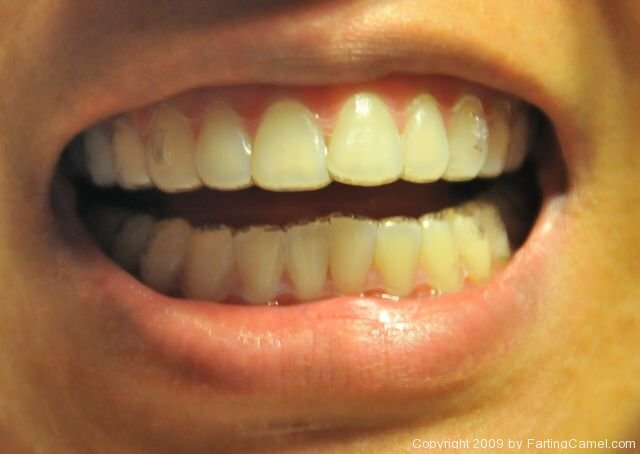 I used to have almost perfect teeth, those kind that remind you of the ‘fake teeth set’ in the dentist office. Then last year, I have a car accident that smashed my lower jaw. I bled a lot and got nine stitches on my lips and chin. By the way, the stitching on the lips was unbelievably painful and they swelled to at least threes times its normal size. I called them my upsize jolie-lips. The impact really messed up my teeth. They became loose and I waited for a year before I embarked on my invisalign project. This is the picture I took with my first aligners. The picture looks like it is out of focus, but it is due to the plastic aligners. Look carefully.